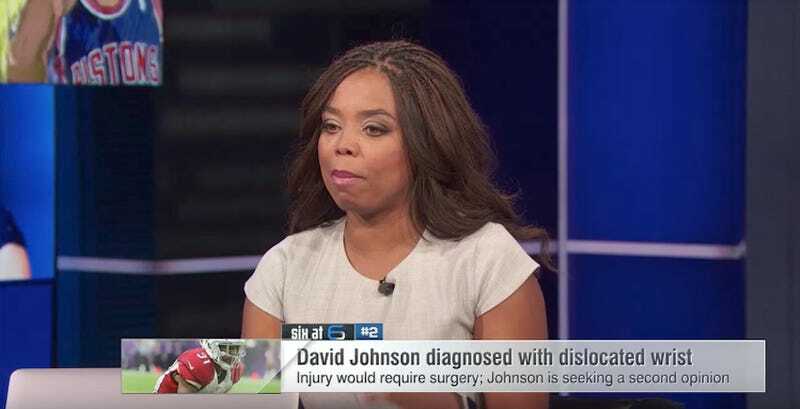 ESPN SportsCenter host Jemele Hill called Donald Trump a bigot and white supremacist on Twitter Monday night, and the backlash to these pretty standard and well-founded opinions compelled the network to give Hill a talking-to and to release a statement. An ESPN spokesperson wouldn’t elaborate on whether Hill faced any discipline beyond a conversation with her bosses. These were some of Hill’s tweets. They seem pretty accurate and not at all inappropriate. And so the pile-on began, led by cynical hucksters and backed by the same disingenuous internet browbeating tactics that have served the right for years in campaigns against studiously apolitical corporations that want nothing more than for no one to be angry at them, whether or not what anyone claims to be angry about makes any sense. (How is it politicizing sports to describe a man who supported neo-Nazi protesters in a nationally televised press conference as a white supremacist?) It is a shame and a wonder that ESPN thinks it’s possible to appease people who don’t even want to be appeased. All this said, here’s what happened: In the face of strident tweeting from the guy who lost a fight to an airline and a former employee best known for dressing down a service worker, ESPN felt that it had to grovel before the racist uncle demographic so as to not give off the impression that it leans left, even though the country singer fired for comparing Barack Obama to Hitler just reclaimed his ESPN gig wherein he yell-sings about being prepared for football, and even though “[Donald Trump] has empowered white supremacists” is not a partisan statement. This is probably a good time for any ESPNers who are just saying that they’re simply concerned with securing the existence of their people and a future for white children to speak up about any show ideas they have in mind.